Now accepting applications for our Firefighter Internship Program. If you are interested in a fire service career, Travis County ESD No. 2 is offering one of the best opportunities to prepare you. Establishing a career as a firefighter/emergency medical technician is very challenging. The knowledge skills and abilities required of today’s firefighters can be ominous. The Travis County ESD No. 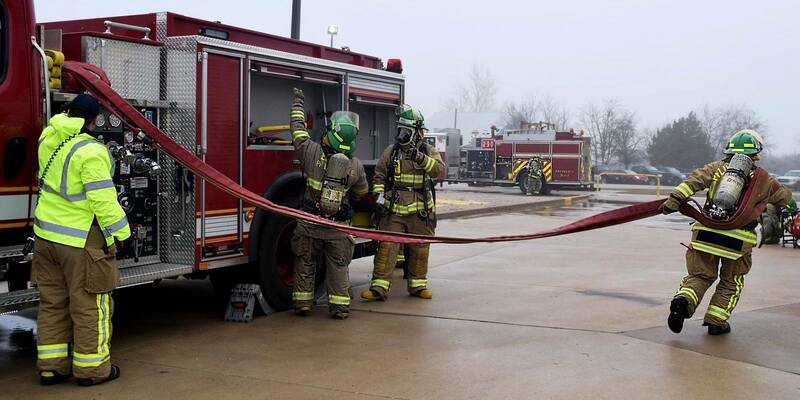 2 internship program enables you to become a well rounded firefighter though education and experience at the same time. Travis County Emergency Services District (ESD) No. 2 designed its Internship Program to appeal to motivated individuals who are dedicated to learning the skills necessary for a career in the fire service. By providing an Internship Program, the District benefits by being able to attract, identify and train a diverse group of promising candidates for potential future employment. The community is also served when area citizens can advance their career goals close to home. The Internship Program gives interns an inside look at the District, and the District likewise has an opportunity to observe and assess an intern’s dedication, skills and performance. This affords both parties an opportunity to see if an employment relationship meets both parties’ needs. The District provides equal employment opportunities (EEO) to all applicants without regard to race, color, religion, gender, sexual orientation, national origin, age, disability, military service or genetic information. Offers interns, accepted into the program, a monthly stipend of $1,000.00 upon successful completion of each period of training, up to a maximum of $4,000.00. Stipends will only be offered for periods for which an individual is meeting monthly objectives in the program. Also, while employment is not guaranteed, successful completion of the Internship Program and passing the necessary exams may lead to employment with the District or other fire service employers. Training for the Candidate Physical Ability Test (CPAT). ARE YOU ELIGIBLE TO JOIN THE INTERNSHIP PROGRAM? Successfully complete an EMT-Basic aptitude exam. If an applicant has either the TCFP certification or the EMT-Basic certification, he or she can attend the Internship Program to complete their missing component required to serve as a firefighter in Texas. WHAT IS REQUIRED DURING THE PROGRAM? Under the direction of the Training Chief and supervised by District members, the program traditionally lasts 16 weeks (typically August until mid-December) and requires 40 hours per week of classroom and hands-on instruction; generally from 7 a.m. to 4 p.m. Interns are trained concurrently in fire prevention, suppression, rescue, public fire safety education, and emergency medical services. Outside the classroom interns will make fire prevention visits, participate in public education, perform general administrative assignments, and may, with appropriate waivers, participate in ride-alongs on emergency vehicles. A high level of physical fitness is required, and training is provided to help interns meet the physical ability test standards. Interns will engage in physical labor and physical fitness, including hose rolling, cleaning apparatus and stations, and emergency scene clean-up. Positive performance evaluation by staff throughout the program. WHAT HAPPENS AFTER COMPLETING THE INTERNSHIP PROGRAM? Meet the National Fire Protection Association (NFPA) 1582 physical requirements. Once an intern has met these standards, the intern may receive an offer for employment from the District. Offer of employment is not a guarantee by this program. Any employment offer will be subject to the District’s standard selection processes (including a background check, drug screen, and NFPA physical) and available vacancies. If hired, the intern will be employed as a probationary firefighter and be enrolled in the District’s Recruit Academy. For more information regarding this program and how to apply, please view the documents below.